92 m a s s a g e & b o d y w o r k s e p t e m b e r / o c t o b e r 2 0 1 8 technique MYOSKELETAL ALIGNMENT TECHNIQUES modern lives, our clients become more prone to depression, anxiety, and pain. 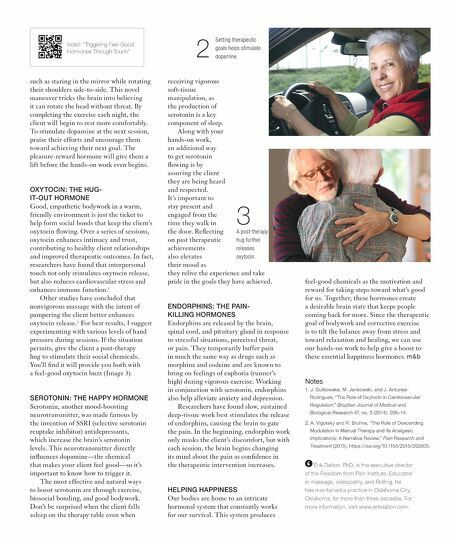 In this column, we'll discuss four brain molecules linked to happiness and offer simple ways to help trigger their release. The acronym DOSE (dopamine, oxytocin, serotonin, and endorphins) is used to describe the hormonal quartet responsible for those feel-good feelings, and although there are many ways to stimulate their secretion, we'll focus on the ones we can get our hands on (Image 1). DOPAMINE: THE PLEASURE- REWARD HORMONE Secreted by the hypothalamus in anticipation of rewards, dopamine is a chemical messenger called a neurotransmitter. It drives our brain's reward system and stimulates pleasure-seeking behavior, motivating us to take action toward goals, desires, and needs—and giving us a surge of reinforcing pleasure as we achieve them. Boost the Bliss Triggering Feel-Good Hormones Through Touch By Erik Dalton, PhD 1 Everyone knows good bodywork feels good, but what causes those feel-good feelings and how can we further elevate our clients' happiness hormones? To begin, we must understand the neurochemicals associated with bliss. According to Christopher Bergland, author of The Athlete's Way: Sweat and the Biology of Bliss (St. Martin's Press, 2007), the human body is blessed with the ability to produce its own happiness hormones—and there are steps we can take to help trigger their release. "Life in the human body is designed to be a blissful experience. Our evolutionary biology ensures that everything necessary for our survival makes us feel good. All animals seek pleasure and avoid pain," Bergland states. "Therefore, our brain has a wellspring of self-produced neurochemicals that turn the pursuits and struggles of life into pleasure and make us feel happy." However, one of the side effects of living in a digitally driven world is that our biology is often short-circuited, causing us to be increasingly removed from our innate physicality. As the balance of neurochemicals that have evolved for millennia become disrupted by today's Clients love to set and achieve therapeutic goals, from freer movement and posture improvement to enhanced performance and less pain, and we can use our understanding of dopamine to help them get what they want. For starters, break big bodywork goals down into smaller ones so the client's brain can celebrate with a hit of dopamine each time it anticipates reaching the finish line. To avoid a dopamine hangover, continue to stimulate the release of this happiness hormone by helping the client set a new goal prior to achieving the current one. For example, if a client comes to you complaining of a chronic neck crick that's affecting their sleep and impairing their driving due to lack of head rotation, ask them to make note of how much better their neck feels on the drive home (Image 2). Just the anticipation of moving better will enhance dopamine production and, in turn, the hands-on work. To keep the feel- good chemicals flowing, instruct your client to perform a simple homework exercise, Triggering feel-good hormones through touch.